Alpha Kappa Psi’s five-member Adobe Team at Illinois State consists of Ben Justice (left), Hunter Highfill, Carrie Happel, Konner Foster, and Derek Blidy. Little did Mason Nelson ’18 expect that including knowledge of Adobe Creative Cloud programs on his LinkedIn profile would lead to a corporate sponsorship for a student organization at Illinois State University. 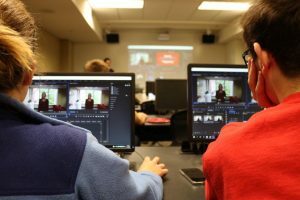 The partnership between Adobe and the coed, professional business fraternity Alpha Kappa Psi began in fall 2017, when Nelson was contacted through his online resume profile about the possibility of serving on Illinois State’s campus as a brand ambassador for the software developer. After completing an application and interview process, Nelson, established a team of students to help prepare regular, on-campus workshops on Adobe software for their peers. The members cover the basics of navigating the various programs and provide tricks of the trade to help Illinois State students become more comfortable with utilizing the design tools. Nelson’s involvement with the Adobe Team at Illinois State also took him to California last summer. After applying to the Young Creators program, he was chosen to travel to San Francisco along with other Adobe student ambassadors. He recalled how, along with his fellow students, he had the opportunity “to tour the Adobe office, meet the product marketing teams, network with each other and Adobe employees, give feedback on the products through a student’s perspective, get trained on the programs, and learn about the upcoming plans that Adobe has.” Additionally, the students made year-in-review presentations about their campus groups. Carrie Happel, a senior integrated Marketing Communication major, now heads Alpha Kappa Psi’s five-member Adobe Team at Illinois State. Happel’s interest in Adobe products began as a hobby but since has opened doors for business opportunities. From there, she asked someone to help her learn the basics of Adobe Illustrator and then proceeded to continue teaching herself via online resources. Then, as a pledge for Alpha Kappa Psi, she worked on a new business venture for creating Snapchat filters using the program. “That kind of pushed me to teach myself more because I had a job and a goal to work for. I really just taught myself for that one purpose, and after I learned it, I started doing all these different things with it,” she said. Before long, Happel started a side business designing T-shirts with her cousin, and now as she moves toward graduation, she feels more confident applying to jobs requiring experience with the Adobe software. Along with her fellow Adobe Team members, she hopes to equip other Illinois State students with this type of valuable experience. This spring, the ambassadors are looking to provide lessons on such topics as Photoshop, Illustrator, Lightroom, and creative resumes and portfolios. Just as the Alpha Kappa Psi is open to all majors, anybody on campus is welcome to come to the workshops. No registration required for the events. Visit Adobe at Illinois State University to stay up-to-date on upcoming workshops and learn about incentives offered by Adobe Students. During a partnership between Adobe and the coed, professional business fraternity Alpha Kappa Psi, students serve on campus as a brand ambassador for the software developer. Happel also pointed out that students can access Adobe software in the computer labs in the College of Business and can download a free weeklong trial of the various programs if they are interested in practicing their design skills. Happel agreed, noting her experience with the software has helped her to achieve positions as a student leader in the College of Business.